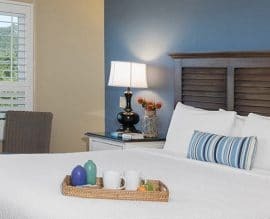 Blue Dolphin Inn is an upscale boutique hotel perfect for those grownup getaways. Spend some time with friends and loved ones at our midscale boutique hotel. 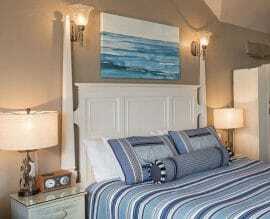 Families will enjoy the pool and jacuzzi, and the close proximity to the tide pools and beach. Uniquely designed cottages provide the perfect escape of solitude in a beautiful setting. If I could give more than a “5” rating, I would! This place was lovely! The room was spotless and beautifully decorated in blues and white. As a plus, we have a partial view of the ocean.The staff were friendly, professional and accommodating. They even provided extras for the guests–you could use their umbrellas or beach chairs. Also they provided window cleaning supplies for your car windows (windows can get covered with moisture from nighttime fog). And the area! Unbelievably gorgeous! You only have to walk across Moonstone Drive (small street in front of the inn) to the boardwalk and beach. I loved this Inn. The décor is so clean and unique. I truly felt like I was visiting my best friend’s house on the ocean. Lovely, clean, inviting from the minute you walked in the door. Comfortable bed, pillows, towels, a little microwave and refrigerator, coffee maker with teas, hot chocolate, and coffee, dark chocolate, chocolate chip cookies, a little table with comfy chairs, fireplace; free Wi-Fi, well-lit supplied bathroom, well-lit room, TV (which we didn’t use), great healthy-choices breakfast – what more could you ask for? The hotel was quiet, relaxing and right across the street from the water. There didn’t seem to be many kids here which was an added bonus for us since we were hoping for a relaxing romantic getaway. This hotel also offers a free continental breakfast in the morning. Next time we come back (there will definitely be a next time) we are going to try and get a room with a patio/full ocean view. 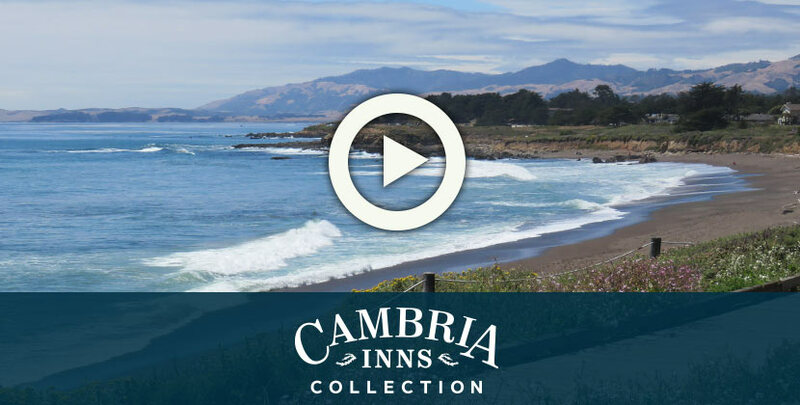 “Paradise by the Sea” We have been visiting beautiful Cambria for 4 years in a row and always stay at the Blue Dolphin. It is a fabulous inn. Clean, comfortable, and friendly. Great breakfast delivered to your room. Ocean sounds and great sunsets add to the charm. If I could give more than a "5" rating, I would! This place was lovely! The room was spotless and beautifully decorated in blues and white. As a plus, we have a partial view of the ocean.The staff were friendly, professional and accommodating. They even provided extras for the guests--you could use their umbrellas or beach chairs. Also they provided window cleaning supplies for your car windows (windows can get covered with moisture from nighttime fog). And the area! Unbelievably gorgeous! You only have to walk across Moonstone Drive (small street in front of the inn) to the boardwalk and beach. I loved this Inn. The décor is so clean and unique. I truly felt like I was visiting my best friend's house on the ocean. Lovely, clean, inviting from the minute you walked in the door. Comfortable bed, pillows, towels, a little microwave and refrigerator, coffee maker with teas, hot chocolate, and coffee, dark chocolate, chocolate chip cookies, a little table with comfy chairs, fireplace; free Wi-Fi, well-lit supplied bathroom, well-lit room, TV (which we didn't use), great healthy-choices breakfast - what more could you ask for? The hotel was quiet, relaxing and right across the street from the water. There didn't seem to be many kids here which was an added bonus for us since we were hoping for a relaxing romantic getaway. “Can I give more than a "5" rating?! ?” If I could give more than a "5" rating, I would! This place was lovely! The room was spotless and beautifully decorated in blues and white. As a plus, we have a partial view of the ocean.The staff were friendly, professional and accommodating. They even provided extras for the guests--you could use their umbrellas or beach chairs. Also they provided window cleaning supplies for your car windows (windows can get covered with moisture from nighttime fog). And the area! Unbelievably gorgeous! You only have to walk across Moonstone Drive (small street in front of the inn) to the boardwalk and beach. “Marvelous!” I loved this Inn. The décor is so clean and unique. I truly felt like I was visiting my best friend's house on the ocean. Lovely, clean, inviting from the minute you walked in the door. Comfortable bed, pillows, towels, a little microwave and refrigerator, coffee maker with teas, hot chocolate, and coffee, dark chocolate, chocolate chip cookies, a little table with comfy chairs, fireplace; free Wi-Fi, well-lit supplied bathroom, well-lit room, TV (which we didn't use), great healthy-choices breakfast - what more could you ask for? “Absolutely loved this place!” The hotel was quiet, relaxing and right across the street from the water. There didn't seem to be many kids here which was an added bonus for us since we were hoping for a relaxing romantic getaway. This hotel also offers a free continental breakfast in the morning. Next time we come back (there will definitely be a next time) we are going to try and get a room with a patio/full ocean view.